Seeking A Better Life, A Migrant Survives A Shipwreck And Wonders What's Next : Parallels More than 200 migrants drowned on Sept. 21 trying to cross the Mediterranean to Europe, in search of better lives. A survivor explains why he risked the journey. 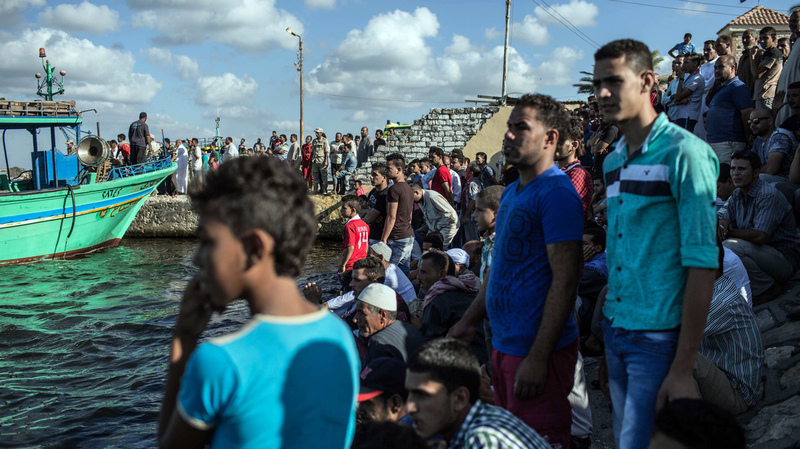 Egyptians wait on shore in Rosetta on Sept. 22 as a coast guard boat arrives carrying the bodies recovered from a boat that capsized off Egypt's Mediterranean coast. The young men left in the middle of the night, some without saying goodbye or telling their families they were leaving with smugglers who promised them passage to Europe. Instead of landing in Italy where they planned to seek asylum, the overcrowded fishing boat sank soon after setting off from Egypt's Mediterranean coast Sept. 21. According to the United Nations refugee agency, smugglers had crammed as many as 500 people aboard. At least 204 people drowned. They were among the thousands of desperate Egyptians and other Africans who are increasingly turning Egypt into a major crossing point to Europe. In the coastal town of Rosetta last week, relatives of some of the Egyptian victims gathered at the shore waiting for the Navy to raise the sunken boat and recover more bodies. The men waiting at the shore are mostly farmers and fisherman with the grim expressions of those who expect little from life and have received even less. The young people who left wanted more. "My nephew was 18. He wanted to work and get married and live a normal life," says Ahmed Said Shalan, from the nearby village of Jazirat al-Khuthera where more than a dozen of the young men came from. Shalan had already buried his nephew, Mohammed. He had come to the port in solidarity with other villagers still waiting for the bodies of their relatives. Shalan says he last saw his nephew four days before he left. "He was anxious about something," Shalan says. He chokes up with emotion and abruptly walks away. The International Organization for Migration says "nearly half" of the 204 people whose bodies have been recovered so far are Egyptian. The others include Sudanese, Eritreans and Somalis. As neighboring Libya becomes increasingly violent, Egypt has become a main transit point for asylum seekers trying to reach Europe by paying smugglers to get them across the Mediterranean Sea. On Wednesday, nervous-looking soldiers joined hands to keep back the crowds of relatives. Townspeople blame the military for not responding to distress calls from the sinking vessel. Local fishermen rescued survivors and retrieved most of the bodies. "We were out fishing and when we heard about it we headed back and spent almost two hours looking for them," says Hanni Mohammed Ahmed. He says he and his crew pulled 96 survivors from the water. "Some had life jackets, some of them were swimming, some were holding onto a piece of foam. I picked up one who was hanging onto a body," he says. Rosetta, known as Rasheed in Arabic, was an important archaeological site where the Rosetta Stone — inscribed rock that enabled scholars to decipher ancient Egyptian hieroglyphs — was found. The distinguished history is no solace to the thousands of young men who don't see a future. Egypt, which has traditionally been a poor country, is facing its worst economic crisis in years. Rising inflation has made food and clean water unaffordable for many. The Egyptian government says official unemployment is about 12 percent and unemployment among young workers close to 30 percent. Both figures are widely believed to underestimate the true extent of joblessness. In 2014, the World Bank estimated youth unemployment in Egypt to be 42 percent. With no way to support themselves or start families, the young men feel stripped of their dignity. For some, the risks of the sea crossing pale in comparison. Omar, who was rescued by a fishing boat, has a diploma from an agricultural college. He says he tried but failed to find any kind of work, and has no way to support his sick, widowed mother. He says he doesn't have even the few cents needed to buy cigarettes. "Everyone who goes [to Europe] starts building a future," Omar says. "Circumstances here are difficult ... where would I find work? I know people who have been applying for years and they didn't get anything." So he borrowed the equivalent of almost $3,000 from the bank and friends and relatives to pay the smugglers. Now, he has no way to pay it back. The 25-year-old, who is too afraid to give his last name, has gone into hiding in another town. He speaks in a monotone and barely makes eye contact. His mother didn't know he had left and he hasn't called to tell her where he is. He is ashamed that he failed to get to Europe and terrified his creditors will track him down and have him arrested. "If I could pay back some money and send her some money, then I could call her and tell her I'm OK," he says. "I lost everything, I have nothing left."